I feel like the Internet has been going Mexican crazy the last few weeks. I’ve been reading posts about Mexican food left and right. So last night, right before I went to sleep, I decided to to eat tacos for lunch at Tehuitzingo (Yes, that’s right, I think about lunch right before I go to sleep, I’m not ashamed to admit it.). Before I left for Tehuitzingo, I checked MenuPages and I knew what I wanted. Pig ear! I mean, I never had pig ear in a taco before, so it just seemed logical. 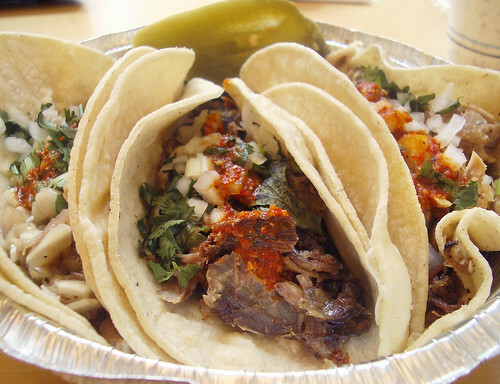 I also got a Barbacoa (Goat) Taco and a Carnitas (Pork) Taco, just for good measure. My favorite definitely had to be the Oreja Taco ($2.50). The taco was slightly crunchy because of the cartilage from the pig ear and also had a sticky mouth-feel because of the gelatinous outside. The texture reminded me of oxtail, but without so much actual meat. It tasted especially good with the homemade hot sauce the tacos came with. The Barbacoa Taco ($2.50) was a bit dry, but also very flavorful in that nice gamey goat way. The Carnitas Taco ($2), although juicy, was my least favorite. I actually thought it had too much pork in relation to the amount of vegetables in the taco. As a result, the taco seemed a little one note. 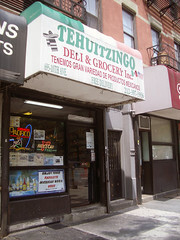 They do have extra onions, limes, and hot sauce on the counter at Tehuitzingo. Next time, I’ll load up on the sides if I get the Carnitas Taco again. 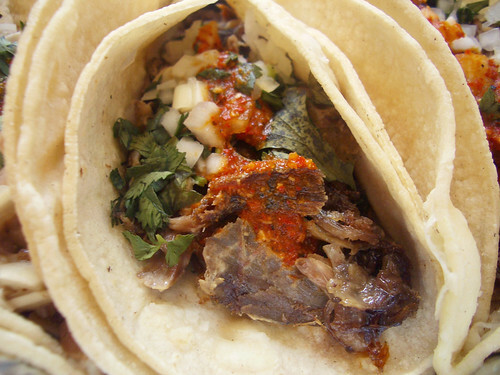 Although, considering they have more interesting items like tripe and tongue on the menu, it might be a while before I get around to the Carnitas Taco again. Me: i got pig ear taco! Eunice: how am i gonna know if that place is good or not if u keep eating cows feet and pig ears! Eunice: they’ve got great cow’s feet! Me: cmon it was good. anyway, i got a regular pork one too. Great pics as usual. I’m not a huge fan of Tehuitzingo. I love their authenticity but I found the al pastor taco to be dry and rather flavorless. What’s worse (and I know you can’t expect much from a hole in the wall Mexican grocery), the kitchen in the back was small and dirty, their was raw chicken everywhere. I’d be lying if I said I wasn’t relieved to not get salmonella. Definitely not the city’s best tacos as some people say. I’d sooner go to Tulcingo del Valle for one of their entrees covered in any of their delicious sauces. The chipotle sauce is great there but the tacos aren’t amazing. Have you been to Red Hook Ball Fields yet? That’s where it’s at. I added your link to my site, and I’d be honored if you did the same for me. You know, I didn’t find Tehuitzingo dirty at all, and I’m still alive so I can’t complain. 😉 Yeah, and I have to agree, Tehuitzingo does not compare to Red Hook, but Red Hook doesn’t have pig ear tacos! At least they didn’t last year. I’ll check out Tulcingo del Valle, thanks for the suggestion. Also, I haven’t gone this year yet to Red Hook, but I hear it’s not as good as previous years. What do you think? Hmm.. pig ear tacos you say?! That sounds really interesting actually. I’ve had pigs ear plain and it’s good. Never really thought of it as a taco filling though… hmmm..
Sure, why not. In Puerto Vallarta, they even had tacos made with ant eggs. I didn’t try it, but I’m sure it can’t be bad. Tacos just rock!